Cat owners this one is for you! 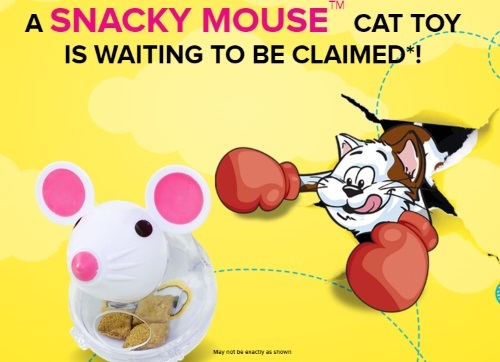 Get a Free Temptations Snacky Mouse Cat Toy with this latest offer! Collect and mail 4 Temptations pouch tops (from 60g-350g packs) to get this offer. The gift pack includes two snacky mouse toys and a bag of temptations cat treats. There doesn't seem to be any kind of special packaging for this to be eligible. Requests must be sent in by July 8 and received by July 18, 2016. Please allow 6-8 weeks for delivery. Mine just loves them too...can't wait to get his toy in the mail.